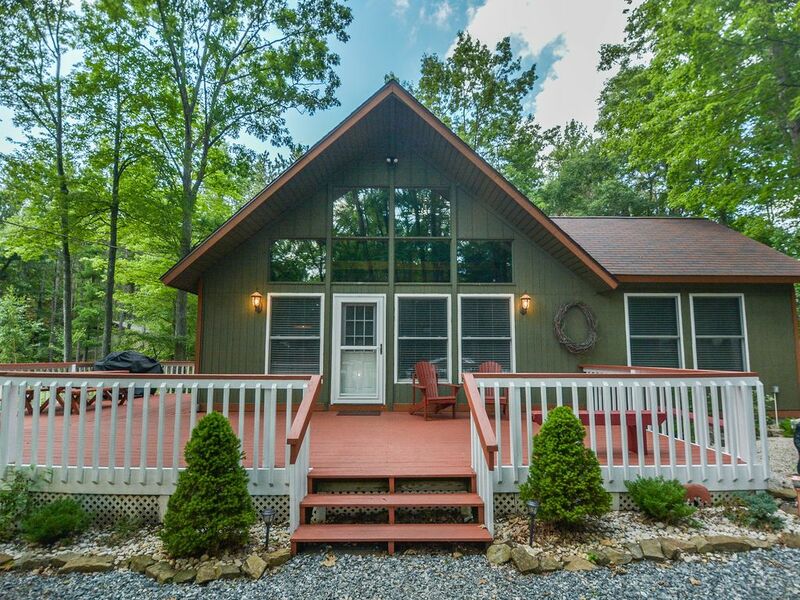 Charming cottage with outdoor fire pit & lots of community amenities! After a fun day of skiing or snow tubing, you can count on getting a good night's sleep in the main level bedroom with a king and a TV. A second bedroom with a queen is equally as comfortable when you want to catch up on your rest. There are two full bathrooms on this level for your convenience. The wooded yard has room to roam, so the kids and your dog will love it! You can kick-back on the deck and fire up the grill for an afternoon barbecue while they run and play. Sunset is the perfect time to gather around the fire pit for s'mores and stories about past trips to the lake. When the stars come out, take a dip in the bubbling outdoor hot tub that will leave you instantly relaxed. Drive a few minutes further to reach Wisp Resort's four season's of adventures! From skiing and snow tubing to mountain biking and ziplining, there are endless options to keep all ages entertained. Atop the mountain, white water thrills await at the Adventure Sports Center International. ​​​​​​​For your convenience, this home offers free wifi. The property was exactly what we were looking for to hang out as two small families. Great experience at Wisp resort and local restaurants. Cottage was clean and comfortable. Would definitely book with the company again. This cottage was exactly what we were looking for and then some! Comfortable, clean and true to description. Definately on our list to return to. The following dates have a 3 night stay minimum requirement: President’s Day, Memorial Day, Fourth of July, Labor Day, Thanksgiving, and New Year’s Eve. 3 Night Minimum required in June-August for all homes that allow partial weeks. Lake front and lake access homes require a 7 night minimum stay 6/8/19-8/26/19. Rates and amenities are subject to change without notice. You must be 25 years of age or older to rent a property with Taylor-Made.